Rocks that resemble granite, a crystalline rock common on Earth, have been found for the first time on Mars using THEMIS images. 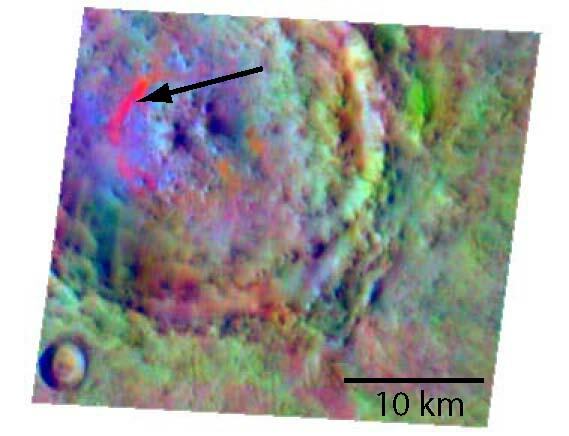 The Thermal Emission Imaging System (THEMIS) on the Mars Odyssey spacecraft identified unusual rocks in the floors and central peaks of two craters in northern Syrtis Major. Each crater is about 30 kilometers (20 miles) in diameter, and about 95 km (60 miles) separate them. Additional analysis of the rock exposures using data from the Thermal Emission Spectrometer (TES) on the Mars Global Surveyor spacecraft reveals they contain quartz along with plagioclase feldspar. This mineral composition closely matches terrestrial granite-like rocks. While quartz-rich granites are common on Earth, this is their first detection on Mars. On Earth, granites often form as a result of crustal rocks being melted when carried down to depths in the Earth by plate tectonics. Mars shows little sign of plate tectonics. Instead, the THEMIS scientists propose the granitoid rocks may have formed when thick sequences of basaltic rocks were metamorphosed by moderate heat and pressure and then partially melted. The scientists observe the granite-like rocks occur in the craters' central peaks, which are dredged up from depths by the force of the crater-making impact. Basalt is a common rock on Mars, and on many other terrestrial planets. The scientists note that granite-like rocks are rare at the martian surface and say this implies that the process that formed them has not been widespread. At the same time, however, the THEMIS scientists argue, the presence of quartz-bearing materials shows that Mars can make volcanic and igneous rocks other than basalts. However seldom it happened, they say, Mars has mechanisms that can produce highly differentiated magmas, and thus the planet has a diversity of surface compositions. Bandfield, J.L., V.E. Hamilton, P.R.Christensen, and H.Y. McSween, Jr., Identification of quartzofeldspathic materials on Mars, J. Geophys. Res., 109, DOI:10.1029/2004JE002290, 2004. Streaks and patches of false-color red mark exposures of quartz-bearing rocks that resemble terrestrial granites. The discovery by THEMIS of this rock type marks a first and implies Mars has undergone volcanic evolution. The scale bar measures about 6 miles long.